The BIFF team is running another fantastic festival of independent filmmaking from February 9-15 and just announced their exciting line-up. 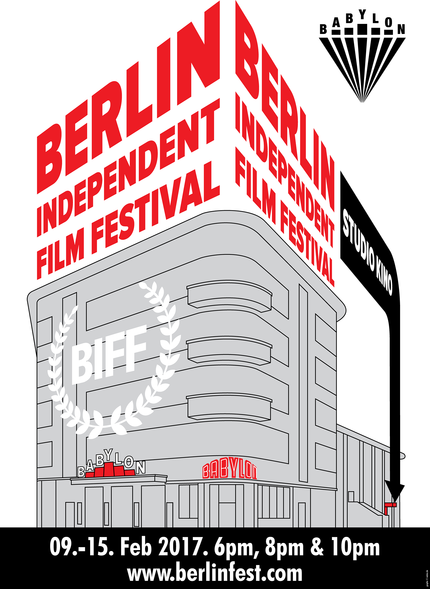 The eclectic programme of international features and shorts will be presented in one of Berlin’s favourite independent cinemas, the Babylon. Highlights of the 2017 festival include the UK-German thriller Red by Branko Tomovic, Why Siegfried Teitelbaum Had to Die by Axel Steinmüller (Germany), Seat in Shadow by Henry Coombes (UK, Spain), Jasmine by Dax Phelan (USA, Hong Kong), and To Keep The Light by Erica Fae (USA). The Berlin Independent Film Festival is at the epicentre for low-budget filmmaking in Europe. While the Berlin Independent Film Festival is not connected with the Berlin Film Festival (Berlinale), BIFF runs at the same time, and not far from the European Film Market and draws on all the film industry power gathered in Berlin for those events. As well as a offering plenty of screening opportunities for indie films, BIFF is developing into a crucial business hub for the low-budget film industry. BIFF hosts workshops and networking social events where attending filmmakers help each other out with marketing advice and EFM tips.